The war ended nearly two decades ago, but tensions remain high and all sides are aware how quickly violent episodes in one ethnic community can morph into a conflict with another. Mr. Vucic’s arrival was precipitated by the death of Mr. Ivanovic, 64, who was shot five times in the chest on a street, his body splayed out on the sidewalk just steps from the office of the political party he led. As Mr. Vucic’s motorcade sped from the north to a Serbian enclave in the south of the country, hundreds of officers lined the highway, standing guard in a blinding snowstorm. The Serb leader tried to walk a fine line on his visit, working to satisfy different audiences — the Serbian people, and the Western leaders he is courting as he seeks to join the European Union. Mr. Vucic is a political descendant of the former Serbian strongman Slobodan Milosevic, who rose to power on the backs of Kosovo Serbs in the late 1980s. As the leader of Serbia, both as prime minister and now as president, Mr. Vucic is taking a page from the Milosevic playbook, casting himself as the central figure in the lives of Serbs living in Kosovo. 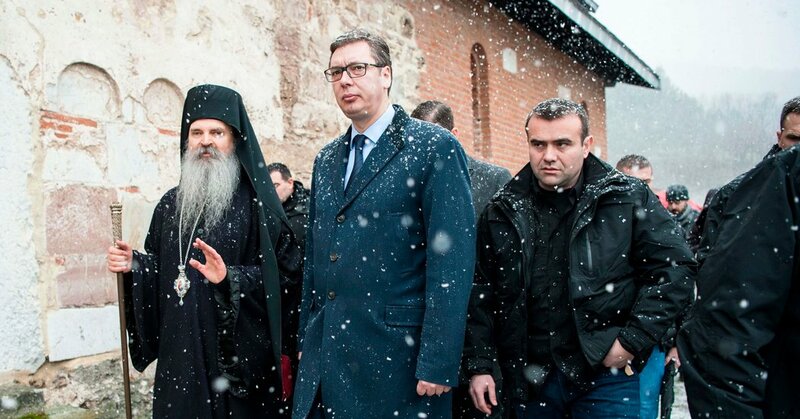 Mr. Vucic, who was greeted by high church officials with a loaf of bread and a thimble of salt on his arrival at the Banjska monastery, has also sought to keep close ties with the Serbian Orthodox Church and is thought to be the main patron of Serb politicians serving in the Kosovo Parliament. But unlike Mr. Milosevic, who defied and fought the West during his rule, Mr. Vucic has cast himself as pro-Western, declaring a break with his radical past as Serbia tries to join the European Union. Mr. Vucic, who has had almost unchallenged control of Serbia’s institutions and news media since his landslide victory in the presidential election in April, has been trying to convince Brussels that shedding his nationalist past is a sign that he is willing to make painful compromises. Kosovo Serbs waiting for Mr. Vucic’s arrival. Thus far, however, Serbia has refused to recognize Kosovo’s independence. And while it must show a track record of improved relations with its neighbor in order to join the bloc, the ties have soured in recent years. In Serbia, the news media routinely lashes out against Albanians and Serbs who back any sort of compromise on Kosovo, using derogatory language to disseminate Mr. Vucic’s populist message against Kosovo’s independence, experts say. “Kosovo, and Serbs in Kosovo, have always been the central part of a nationalist and populist rule in Serbia,” said Dragan Popovic, a political analyst who leads the Policy Institute, an independent think tank in Belgrade. Mr. Vucic is no exception. If he wants to remain in power, Mr. Popovic said, he must keep Serbs in a constant state of fear, particularly in Kosovo, where he has tried to cast himself their protector and savior. “That was the reason he went there immediately after the death of a politician whom he accused of being a traitor,” Mr. Popovic said. He knew his message was not one that many in the crowd wanted to hear. “People are scared and feeling attacked,” he said. But he said it was better to allow the investigation into the killing to play out and for political leaders to talk than for “any bullets to fly.” At the same time, Mr. Vucic said the talks with Kosovo officials on normalizing relations would not resume in Brussels until the murder was solved. Solving the crime under normal circumstances would be challenging. The shooter fled in a car that was later found to have been burned almost beyond recognition — probably destroying any forensic evidence — and there are few promising clues. He also warned the leaders of Kosovo — a country of 1.8 million people, predominantly ethnic Albanians — that it would be a mistake to pass a law suspending a war crimes court responsible for prosecuting former members of a Kosovo Albanian guerrilla group for atrocities during the war of independence. “Please, can you guarantee safety on our own land?” another yelled. Mr. Vucic’s critics accuse him of stoking those fears because they are politically useful, but he has also been trying to keep them in check. While Mr. Vucic called on the authorities in the Kosovar capital, Pristina, to properly investigate the murder, he said that the government in Belgrade was looking into ways to strengthen defenses of Serb residents of Kosovo, including from threats originating in their own community — a bitter complaint that Mr. Ivanovic voiced as people’s main concern in Mitrovica and around the north. “What’s most important for us is to come up with additional mechanisms to fight crime and corruption within our own ranks,” Mr. Vucic said.